iW-RainboW-G17M-Q7 is Qseven R2.0 standard compliant CPU module based on Altera’s Cyclone V System On Chip (SOC) developed for the increased system performance requirements. 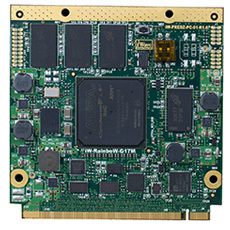 The Dual ARM Cortex A9 CPU with the integrated FPGA fabric allows greater flexibility for the system designers to develop application specific proprietary controllers along with industry standard peripherals available from the multi core CPU . The improved logic integration with integrated high speed transceivers and hard memory controllers of the SOC provides increased bandwidth capacity which is ideal for Industrial Automation, Smart Energy Systems, Video Surveillance, Automotive Telematics, Medical Instrumentation, Defense & Aerospace applications.